Selected as The Universe Today’s Astronomy Picture of the Week, April 7, 2008. Click here for details. Many images of NGC 6188 are wide-field, such as John Gleason’s remarkable H-a image. My image is a clsoe up of an interesting region of the prominent dust- lane structure. 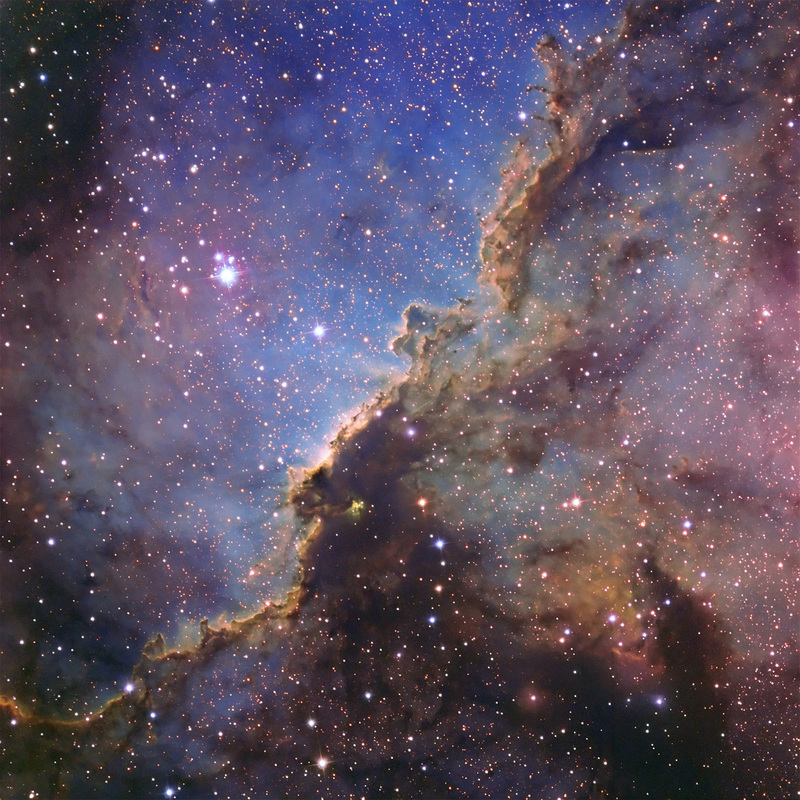 It resembles the "Wall" in NGC7000 in the northern hemisphere. This southern Milky Way structure is 4000 light years distant. The image represents a 45 arcmin square field. The Hubble palette was used where B= OIII, G = H-a and R= SII in order of increasing wavelength. 5 nm H-a and SII, and 3 nm Astrodon OIII filters were used, along with Astrodon E-Series RGB filters. This is a hydbrid image, mixing both mapped narrowband color and conventional RGB color. Exposures were 20 min. for the narrowband filters and 2 min for the R,G,B filters. The U16M was operated at -20C relative.